It's 1971 and the grown ups in New York City have decided to integrate the schools. That leaves it up to the kids to figure out how you do that. How do you build trust? How do you create connection? How do you open the door to acceptance? How do you feel safe? Three days before the end of sixth grade, Francesca, Josie and Jamila are making plans for the first day of seventh grade. They're all going to buy construction boots and wear them proudly together on the first day back. A wave of huge change is about to crash into the girls' world. They're going to be bussed across town, a 45-minute ride, to go to school in a different part of town with kids they haven't gone to school with all their lives. They'll leave their neighborhood behind and get off the bus in the middle of kids they don't know and with kids who don't know them. Turns out Francesca's parents decide to send her to a private school in the city. That leaves Jamila and Josie boarding the bus in September. As the bus takes them farther and farther from home they look at the bus windows and they see the changes. They leave behind the houses with the front lawns and the garden apartments and they pass through the borough where everything "becomes more pressed together: small houses on tight lots." "And the faces change, turning darker, more like mine." As soon as their feet hit the pavement at their new school, they are floundering in unknowns. Their copper and dark skins blend in here but their lives do not. What are they up against? They're up against kids who have already decide the newcomers think they are "better" than the kids who live in this neighborhood. They're trying to find a niche in a society where Tanisha doesn't like John going with a white girl and she's talking about you and you've never thought of yourself as white. It's all color theory. Colors look different up against each other. Jamila and Francesca and Josie struggle to belong. Their parents fought the first wave of the integration battle years ago when they chose to marry beyond their own race and came to buy homes in their neighborhood. It wasn't easy. Plenty of people told them to leave. Even now their aunts and uncles advise the families to move out to the suburbs and get out of the city. It's hard to hate up close. But it's not impossible. Jamila and Josie come with good hearts but that isn't enough to give them an automatic acceptance card or to empower them to automatically accept others. The kids who come from the neighborhood around the school have talents and brains but that isn't enough to open them up to accepting someone who is not one of them. The two "sides" line up here and you can step into the shoes of everyone and feel the fears and the mistrust. 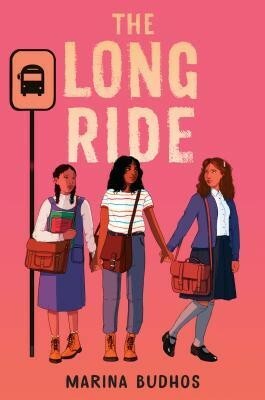 This is a gritty, honest window into how it feels to be the kids who are sent to integrate a school and how it feels to be the kids who are already in the school with these interlopers coming in to their territory. It's a view from both sides of that social experiment. At the same time they're navigating the social issues of their times, the girls are also figuring out how to grow up and maybe even kiss a guy. They're asking themselves questions like, "How much skin do you show? How far do you go to be accepted?" The honesty of the voice of Jamila lets us experience the ambiguities and the risks and the walls. This is the real deal. A great discussion starter to get kids to talk about the racial diversity in their own world and how they decide to accept others. What does it take to let someone "in?" There's an authenticity here that is unique and powerful. and it keeps you reading. Feels like reality television and you want to know what's going to happen next. This one could be a One Book One School option. In the tumult of 1970s New York City, seventh graders are bussed from their neighborhood in Queens to integrate a new school in South Jamaica. Jamila Clarke. Josie Rivera. Francesca George. Three mixed-race girls, close friends whose immigrant parents worked hard to settle their families in a neighborhood with the best schools. The three girls are outsiders there, but they have each other. Now, at the start seventh grade, they are told they will be part of an experiment, taking a long bus ride to a brand-new school built to "mix up the black and white kids." Their parents don't want them to be experiments. Francesca's send her to a private school, leaving Jamila and Josie to take the bus ride without her.